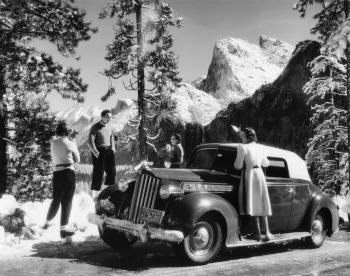 The Mather Tioga road opened "scenic" Yosemite to the automobile. The "Mather Tioga Road" is a story of inspiration and perseverance! 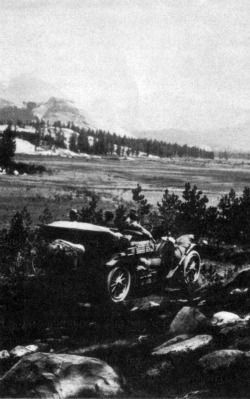 Mather recognized early on that the popularity of the automobile would be the key to bringing future visitors to the National Parks. In Yosemite, he quickly identified the derelict Old Tioga Road as the perfect solution to his dalema. As they say, the rest is history...read about it here. 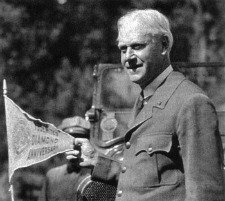 In January of 1915, Stephen T. Mather accepted the post of Assistant to the Secretary of the Interior, in essence becoming the first Director of the National Park Service. An enthusiatic supporter of the modern automobile, the project of highest priority in his new post was to make auto travel within the parks easier. “Raising The Curtain” to the new administration of the national park's, he wanted to make a splash... preferably in Yosemite. Mather had good reason to have high hopes for increased visitation to Yosemite in 1915; California was to be the setting for two international expositions that year. Brainstorming ideas to help attract the crowds, Mather thought about the Tioga Road, a privately owned and now hardly passable horse-path running east and west, bisecting the high country of Yosemite Park. The Tioga Road had the potential to provide an automobile route across the 270 mile wall of mountains stretching from Walker Pass to Bakersfield, and on to Sonora Pass and south to near Lake Tahoe. Its resurrection would be both beneficial and widely acclaimed! As Mather thought about all this, he began to exhibit an inner turmoil, a characteristic reaction of his to weighty decisions…. Trying to be supportive, his associates politely reminded Mather that the government could not make repairs on a road it did not own, and even if it could make the improvements, it probably wouldn't spend the money in any case. Mathers response to this was characteristic of him. He said..."I'll buy the road, have it repaired myself, and donate it to the government." He was then reminded that the United States of America was not a university or charity foundation. "Giving things to the government was about as suspicious as making bank deposits to the account of a Cabinet officer or placing a bomb under a Senator's front porch." Congress would need to examine and pass upon every gift. Not at all discouraged by this, Mather had a special provision drafted for the Appropriations Committee authorizing the Secretary of the Interior to accept any donations of money, land and rights of way for the national parks. Director Mather was certain that this provision would allow him to move forward with his plans.But he was wrong! A Congressman named Fitzgerald surprised him. The Congressman, sure that only a “black-hearted briber” would want to donate something to the government, literally tore the provision up. Mather looked for help from his friends California Senator James D. Phelan and Congressman William Kent. 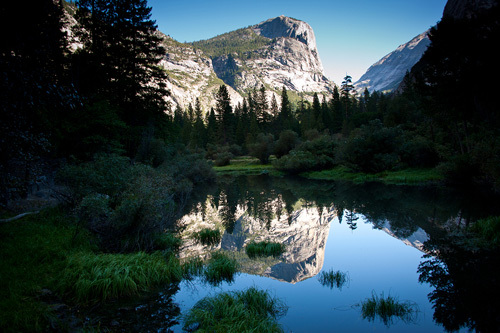 The two politicians worked together to wheedle Congressman Fitzgerald into approving a limited provision covering gifts to Yosemite. Mather was finally set free to proceed with his plans for the Tioga Road. It was at this point that Mather learned that the road carried a purchase price of $15,500. Determined to raise as much as he could through donations, he decided to contribute whatever remained himself. Mather began calling his friends and collecting donations. 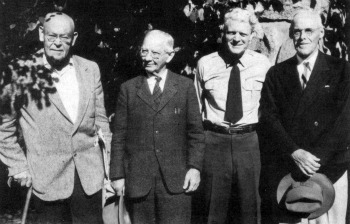 Amongst the contributors was Julius Rosenwald, a Chicago philanthropist who contributed $1,000 and Thomas Thorkildsen of San Francisco who donated another $1,000. The Modesto Chamber of Commerce and Sierra Club collected about $6,000 and Mather donated the remainder. Mather unable to do it himself as a government employee, would then ask his friend and fellow Sierra Clubber William E. Colby to purchase the road from the owners. The purchase was completed, and the offer of the road was made to the Government. Authorization to accept the gift came from Congress on March 3, 1915 and formal title was transferred to the U.S. on April 10, 1915.The Tuolumne County Surveyor was directed to immediately begin clearing the old road. Moving forward, Mather next organized the first of what would become his infamous "mountain trips". 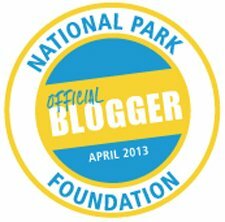 These were intended to convince the influential and wealthy participants of the need for more National Parks. “McCormick, up front, was mute with terror. In the rear, safe-side door open, Albright and Hough sat crouched to leap. Albright was trying to keep one hand on the open door and one foot on the running board and at the same time hold off Hough, who was clawing at him and hoarsely whispering over and over: "G-d d--n that scenery-loving cuss, G-d d--n that scenery-loving cuss!" To their great relief, they made it safely to the top of the range. In "The First Dedication Of The Tioga Road" - Stephen Mather is shown breaking the christening bottle on a "$15,000 rock" that represents the purchase price of the Tioga road. Dr. Henry Fairfield Osborne of the American Museum of Natural History; and Financial supporter Dr. Simmons of Sacramento. At the summit Mather formally dedicated the Tioga Road to future public use, symbolically breaking a champagne bottle filled with Pacific Ocean water at a spot where it would flow both east and west. The night was spent camping with the Sierra Club at Tuolumne Meadows, and the next morning the party started on its final run into Yosemite Valley. 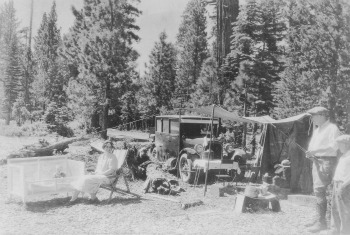 "When same has been put in shape it will be the most popular pass for transcontinental tourists through the Sierra Nevada..."
During the 1915 season 190 cars entered the park over the Tioga Pass and it was noted that for the $5.00 entrance fee a visitor to the park could now travel along 260 miles of road, at elevations ranging from 2,000 to 10,000 feet. The next visitor season, 578 westbound autos had checked in at Tuolumne Meadows. In 1918 park entrance stations were set up in Tuolumne Meadows and Aspen Valley. In that same year a California Motorist article praised the road, and reproduced a map showing 20 percent grades near May Lake. He noted that the top speed on straight stretches was 20 mph, with reductions to 8 mph when ascending and 12 mph when descending the hills. "Again last summer did the Tioga Road amply justify its purchase and presentation to the park system. Again did it prove the needed popularity of a motor gateway to the upper wilderness ... Fifty or sixty automobiles a day traveled the Tioga Road last season with many drivers making the complete trip to Lake Tahoe. It will be noticed that Yosemite National Park as a park, that is, without any special consideration or use of the Yosemite Valley, also seems to be coming into its own. This is a good sign." Even after more than $30,000 had been spent rehabilitating the original route along the old mining road, it became apparent that a thorough reconstruction and realignment was needed to help bring road maintenance costs down to a more manageable level. Mather asked Congress for $75,000 to accomplish this work, but the money was not made available... Park officials continued maintaining the road as best they could. "In 1916, 24 men and 2 teams of horses were assigned to the road which was in many places badly washed with half mile sections almost destroyed by dangerous washouts." "Yosemite Creek bridge was gone and it was replaced by a more permanent structure. In addition more than 30 trees were down across the road between Tenaya Lake and Tuolumne Meadows. By the end of the season the roadway was placed in very good condition considering the state in which it was found in the spring…The public speaks very highly of the park roads, and there has been nothing but praise for the Tioga Road, though conditions are far from satisfactory and not as we would like to have them." In preparation for the 1918 seasonal opening, 1200 pounds of powder was used to blast more than 150 trees off of a five mile section of the road. Later that season more damage from thunder storms and high winds led to repairs costing nearly $6,000. In August of 1922 Sovulewski reported that he considered the road to be in excellent condition once again, but severe storms that fall undid all their work and it was evident that the road was being destroyed faster than it could be kept up with repairs. There was now no question that the road needed to be realigned and reconstructed. Preliminary plans were laid in the late '20s to accomplish the road-work but the job would not really be completed until 1961. Over the years the road was seeing ever-increasing use. 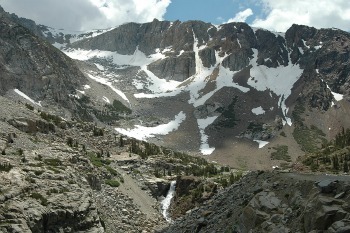 The Tioga Road gained increasing popularity throughout the 1920s. Each summer the opening of the road was attended by fish fries and celebrations with local dignitaries in attendance. Beginning in 1925 an intense interest in earlier opening dates became the new focus of businessmen from east of the Sierra. But early openings remained far too costly due to the price of snow removal and the related maintenance. Despite Mather's Efforts, The Tioga Was Still A "Woods Road"
Newspapers magazine ads and government produced leaflets urged every citizen to visit his national parks but especially to travel what was called “the world's greatest mountain tour through Yosemite to Lake Tahoe”. It was noted too that “The finest accommodations were available on the route as well as comfortable campsites and excellent trout streams”. But the Tioga Road was still a far cry from a modern highway. Gabriel Sovulewski described it as "only an old-fashioned woods road." As early as 1925 consideration had been given to realignment and reconstruction of the Tioga Road. 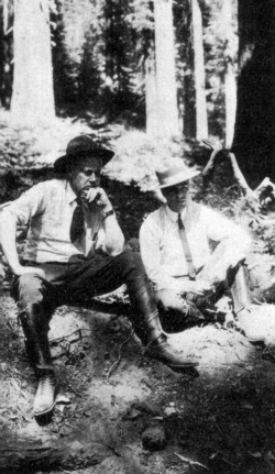 In that year Director Mather visited Yosemite to work out suggested routes with Park Superintendent Charles G. Thomson. Various routes were studied and rejected, with the Park Service submitting each for detailed review by conservationists, engineers and other interested groups. Among the consulting groups was the Yosemite Advisory Board whose three members were imminently qualified to pass judgement on the various proposals. 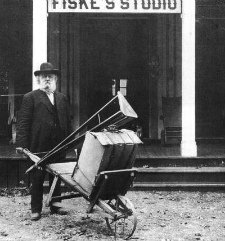 Chairman of the Board was Frederic Law Olmsted. His father is known to this day as the "Father of American Landscape Architecture," and was instrumental in the setting aside of the Yosemite Grant. The Chairman was a world famed landscape architect in his own right, an expert on parks and park development and former director of the California State Park Survey. Olmsted View along the Tioga Road is named in his honor. The second member of the Board, Duncan McDuffie, had served as Chairman of the California State Parks Council, was past president of the Sierra Club and recipient of the Cornelius Amory Pugsley medal for American Scenic and Historic Preservation. The third member, Professor John P. Buwaldo, was a geologist and the departmental chairman at California Institute of Technology. He was the member of the group best able to advise on the Yosemite landscape, having had considerable scientific study in the area. In 1932 a preliminary field survey was made and a tentative route was proposed, marked and declared open for inspection. 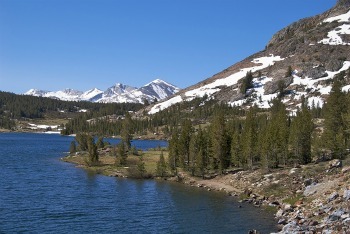 Several field trips were made by interested groups and by 1935 there was general agreement with the concurrence of the Sierra Club that the present route of the realigned Tioga Road would be the one followed. Meanwhile, work had already begun on the eastern and western sections. In 1932 contracts were awarded for construction of the Tioga Pass to Fairview Dome section. The $250,000 for the project, was allocated from monies received from San Francisco as "rental" for the Hetch Hetchy area. Fifty thousand dollars from the same source was earmarked for the Crane Flat to White Wolf portion, and work was scheduled to begin on it in the spring of 1935. 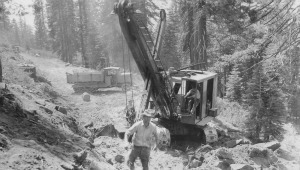 The paving of the 11.6 mile stretch of the new Tioga Road from Cathedral Creek through Tuolumne Meadows to Tioga Pass was completed in the fall of 1937 and for the first time in its history the one-time wagon road had a dustless section. During 1938 the 21 mile McSwain Meadow (White Wolf intersection) to Cathedral Peak section of the unchanged bed of the Great Sierra Wagon Road was oiled for the first time! With completion of the 14.5 miles of new road between Crane Flat and McSwain Meadows on July 18, 1939 a dust filled era of travel within the park had ended. But it would still be nearly a quarter-century before the 21 mile long central section of the old road was finally replaced. Clouds of a different sort appeared on the horizon. 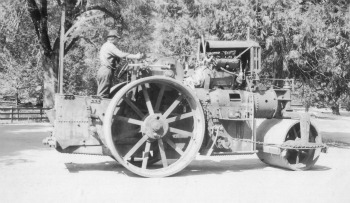 World War II brought a halt to further development of the road. Lack of maintenance funds during wartime caused the closing of the Aspen Valley section of the road. Following World War II, travel to the parks resumed its upward trend. By 1950 use of the Tioga Road had increased more than 30% above pre-war levels. Many felt that damage to the park's scenic values would result if the route agreed upon in 1935 was finished, but many more feared for their lives travelling on the old road as it was. 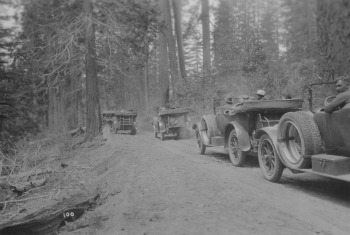 Drivers regularly worried about damage to their cars while trying to negotiate the original "horse-drawn" alignment of the unimproved sections of the Great Sierra Wagon Road. Ever larger cars and the increased use of house and camping trailers made the old road a nightmare. "It is not unusual to find people unused to mountain roads, who just go to pieces, freeze at the wheel and park their cars in the middle of the road to wait for the Park Rangers or a kindly motorist to drive their cars the rest of the way." The general tenor of the many complaints being received was that the road was not only frightening to drive but was completely unsafe, a trip over it being tantamount to committing suicide. But the facts do not bear out all of the hysteria. Accidents on the old 21 mile section were so few that a statistical analysis was impossible. Records are not complete for the earliest days of road use, but it is believed that no lives were lost on the narrow highway since the automobile travel began in 1915. The most common problems were actually traffic jams on steep slopes due to vapor lock, the occasional dented fender, house-trailers caught between trees, and general mechanical break downs. Most common though was the overheating of people's tempers when a speed of 20 miles per hour on a narrow mountain highways was alien to their experience. "These 21 miles are the most exasperating I have ever driven. I will personally guarantee there isn't a trickier road anywhere. It is a good deal like a roller coaster, only rougher! But if your car's in good shape and you are confident of your driving skill; if you are looking for an adventurous route and breathtaking scenery, there's no better place to find them than along the Tioga Pass Road." There was no argument that if the Tioga Road was to adequately serve the public it needed improvement. Although the routing had already been approved years before, World War II had put the project on hold. During the late 1940s and early '50s, suggestions by individuals and conservation groups for alternative routes continued. "This is a subject to which the Yosemite Advisory Board has given very careful consideration over a long period of years. 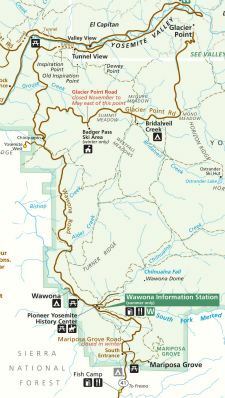 The proposal to route the road north of Polly Dome is, in our opinion, a grave mistake, because it would intrude a road into an area that is now and will remain wilderness in character if the road is not built." The Board endorsed the Park Service's original plan throughout. Accordingly, it was determined that the 21 mile central section of the Tioga Road would follow the route as proposed by the Park Service and as endorsed by the Yosemite Advisory board. There still remained question of standards, however. What would be the most appropriate construction guidelines for the new central section and who would be the best qualified person to undertake this study? Fortunately, Director Wirth was able to secure the services of Walter L. Huber, the country's most outstanding authority. Mr. Huber was not only a noted consulting engineer and past president of the American Society of Civil Engineers, but was a nationally recognized authority in the field of conservation. He was also a former president of the Sierra Club and present chairman of the National Parks Advisory Board. Mr. Huber was often called to advise State and Federal agencies contemplating construction where esthetic considerations were important. "I feel that the Tioga Pass road is and must remain essentially a park road. For this purpose I consider the 20 foot width of pavement to be satisfactory, i.e., two 10 foot width travel lanes. I would recommend that the 3'0" shoulder on either side of the pavement be widened to 4'00". I note that this is to be a stabilized base native grass shoulder. I hope this specification will be retained with insistence otherwise, shoulders are soon coated and from the motorists' viewpoint look the same as pavement; thus we have in effect a 24 foot pavement without shoulders and once the motorist is over the edge he is often in trouble." He approved the Park Service standards on the remainder of the road, maintaining the 2 foot shoulders. Mr. Hubers recommendations were ultimately accepted by National Park Service and Bureau of Public Roads officials and were incorporated into the final road plans. Actual new construction began in 1957, with contracts let that year for clearing and grading 6 miles on the west end of the 21 mile section and 4.5 miles of the easternmost portion. At that time the total cost of re-doing the 21 mile section was estimated at $4,658,000. Preservation of scenic values was uppermost in the minds of all connected with the project. If a slight realignment would save an unusual natural feature - an ancient juniper, a lodgepole pine grove or glacial erratic boulder - the changes were usually made. "There were changes made in the plans for the Tioga Road which took into consideration several of the suggestions made by the conservation people ... I think the final decision was a good decision which took into consideration the many problems confronting us. No road ever reconstructed in the National Parks has had the detailed study and consideration that has been given to the Tioga Road. The route and standards were under intense study for 31 years . . ."
"When the debris of construction operations is cleaned up and the project fully completed, I am sure there will be virtually unanimous approval of this road which is designed to present to the motoring public –a sample of high Sierra park wonder land ... I am sure that hundreds of thousands in future years will be thankful for this opportunity to receive enjoyment and inspiration from it's superlative scenery." The full 21 mile central section was completed and officially opened to the public on June 24,1961. The Tioga Road today is the most scenic route in all of California and is one of the most outstanding park roads in the entire National Park System. It has been carefully designed and built to display the dramatic park values of the Sierra Nevada. The road is the highest trans-Sierra crossing with an elevation of 6,192 feet at Crane Flat and reaching 9,945 feet 46 miles later at Tioga Pass. It is designed for leisure travel with numerous turnouts and overlooks where park visitors may stop safely to enjoy the remarkable scenery. At each vista point are interpretive signs which introduce and acquaint the visitor with the scenery that surrounds him. The interpretive texts at these vista points, have been carefully prepared by the park's naturalist staff. In some locations short loop nature trails lead away from the vista points to give the visitor a further opportunity to explore the nearby natural features. Some sections of the old Tioga Road have been retained for those lovers of park history who like to get away from the main route. One section leaves the road just east of the White Wolf intersection winding and twisting five miles down to Yosemite Creek where the visitor will find the same primitive quality campground which has served travelers on the old Tioga Road since it was first constructed. An additional two mile section of the old road climbs via Snow Flat to the May Lake Trail Junction, and other shorter sections still serve the primitive campgrounds along the original old road. Weather conditions can change quickly at extreme altitudes and it is not at all unusual for seasonal snowfalls to linger into June. Before starting your trip, it is always a good idea to check the status of the road on the page of the Yosemite National Park Service’s web site entitled "Tioga and Glacier Point Roads Plowing Update". To return to the Home Page from Mather Tioga Road please click here. 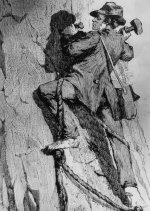 Yosemite's George Anderson, the first to climb Halfdome.